Meitnerium is a chemical element in the periodic table. Its atomic number is 109. It is not found on earth naturally. Because of this, it needs to be made in a science laboratory. Its half life, or the amount of time it takes for half of the element to go away is a little over one second. Meitnerium was first made in 1982. 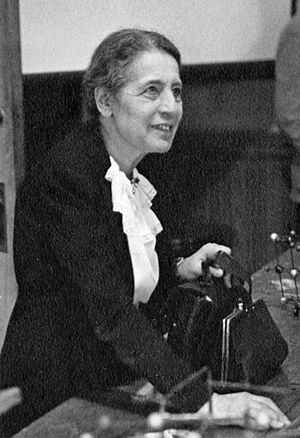 It is named after the German scientist Lise Meitner (1878-1968). The two letter abbreviation is Mt and is a solid. Nobody knows for sure what meitnerium looks like, but scientists think it is a white, gray, or silver color. Meitnerium Facts for Kids. Kiddle Encyclopedia.